When Ian Fleming released his tenth book about his secret agent James Bond back in 1962 he was not prepared for the reviews that followed. 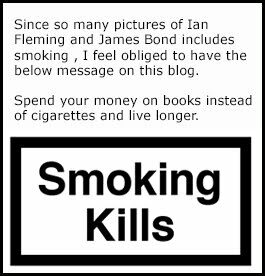 Ian Fleming was somewhat sick and tired of writing the Bond novels and had previously changed his formula by writing short stories in his FOR YOUR EYES ONLY collection released in 1961. This time he did something completely different. He did not write the book from James Bond perspective but instead from the female mind and he decided to only let James Bond apear in the second part of the book half way into the story. When the novel was released on April 16 in 1961 the reviewers were not happy about the drastic change Fleming had done to the formula. Sadly I do not own any of the reviews in print in my collection but the below review quotes can be found on Wikipedia. The Daily Telegraph, wrote "Oh Dear Oh Dear Oh Dear! And to think of the books Mr Fleming once wrote!" while The Glasgow Herald thought Fleming finished: "His ability to invent a plot has deserted him almost entirely and he has had to substitute for a fast-moving story the sorry misadventures of an upper-class tramp, told in dreary detail." Writing in The Observer, Maurice Richardson described the tale as "a new and regrettable if not altogether unreadable variation",[going on to hope that "this doesn't spell the total eclipse of Bond in a blaze of cornography".Richardson ended his piece by berating Fleming, asking: "why can't this cunning author write up a bit instead of down?" The critic for The Times was not dismissive of Bond, who they describe as "less a person than a cult" who is "ruthlessly, fashionably efficient in both love and war". Rather the critic dismisses the experiment, writing that "the novel lacks Mr. Fleming's usual careful construction and must be written off as a disappointment." John Fletcher thought that it was "as if Mickey Spillane had tried to gatecrash his way into the Romantic Novelists' Association". Philip Stead, writing in The Times Literary Supplement considered the novel to be "a morbid version of that of Beauty and the Beast".The review noted that once Bond arrives on the scene to find Michel threatened by the two thugs, he "solves [the problem] in his usual way. A great quantity of ammunition is expended, the zip-fastener is kept busy and the customary sexual consummation is associated with the kill." Stead also considered that with the words of the police captain "Mr. Fleming seems to have summarized in this character's remarks some of the recent strictures on James Bond's activities." Vernon Scannell, as critic for The Listener, considered The Spy Who Loved Me to be "as silly as it is unpleasant". What aggrieved him most, however, was that "the worst thing about it is that it really is so unremittingly, so grindingly boring." The critic for Time lamented the fact that "unaccountably lacking in The Spy Who Loved Me are the High-Stake Gambling Scene, the Meal-Ordering Scene, the Torture Scene, the battleship-grey Bentley, and Blades Club." The critic also bemoaned the fact that "among the shocks and disappointments 1962 still has in store ... is the discovery that the cruel, handsome, scarred face of James Bond does not turn up until more than halfway through Ian Fleming's latest book. Anthony Boucher meanwhile wrote that the "author has reached an unprecedented low". So As you can see above Fleming took a hammering when reading the reviews for his latest novel. Ian took this hard. Actually so hard that he tried to stop the book from being published again. He forbid the book to be published as a paperback, there were to be no comic strip adaptation and when he sold the rights to make films of his books to Albert R Broccoli and Harry Saltzman he only sold them the title for the book and not the story itself. He did not wish to ever have it released again. So how come there is a Pan Books release of the book and why has the book been sold in many different versions after 1962? Well Fleming passed away as we all know on August 14 in 1964 and the rights to his books went to his relatives. They waited three years until the books was released in paperback. 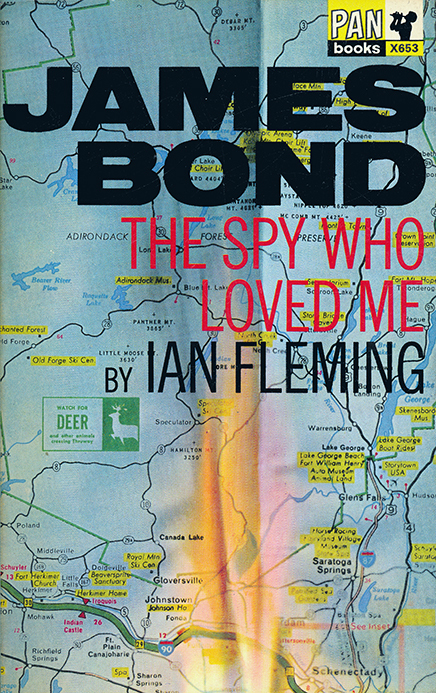 In 1967-68 the book was also the last original Ian Fleming story to be converted into a comic strip. In 1977 the film with the title THE SPY WHO LOVED ME was released by Eon Productions. The title as as we all know the only connection that film has to Fleming. The story was all new. Below is the 1967 paperback released by Pan Books.